Turmeric (Curcuma longa) has been used for 4,000 years to treat a variety of conditions. Studies show that turmeric may help fight infections and some cancers, reduce inflammation, and treat digestive problems. Many studies have taken place in test tubes and animals. Turmeric may not work as well in humans. Some studies have used an injectable form of curcumin, the active substance in turmeric, and not all studies agree. Finally, some of the studies show conflicting evidence. Turmeric is widely used in cooking and gives Indian curry its flavor and yellow color. It is also used in mustard and to color butter and cheese. Turmeric has been used in both Ayurvedic and Chinese medicine as an anti-inflammatory, to treat digestive and liver problems, skin diseases, and wounds. Curcumin is also a powerful antioxidant. Antioxidants scavenge molecules in the body known as free radicals, which damage cell membranes, tamper with DNA, and even cause cell death. Antioxidants can fight free radicals and may reduce or even help prevent some of the damage they cause. In addition, curcumin lowers the levels of two enzymes in the body that cause inflammation. It also stops platelets from clumping together to form blood clots. Indigestion or Dyspepsia: Curcumin stimulates the gallbladder to produce bile, which some people think may help improve digestion. The German Commission E, which determines which herbs can be safely prescribed in Germany, has approved turmeric for digestive problems. And one double-blind, placebo-controlled study found that turmeric reduced symptoms of bloating and gas in people suffering from indigestion. 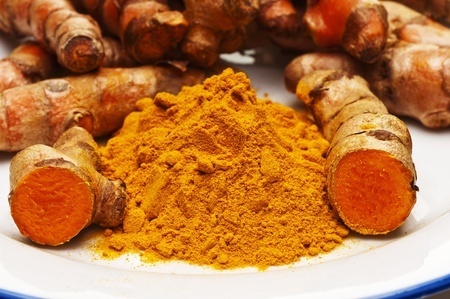 Ulcerative colitis: Turmeric may help people with ulcerative colitis stay in remission. Ulcerative colitis is a chronic disease of the digestive tract where symptoms tend to come and go. In one double-blind, placebo-controlled study, people whose ulcerative colitis was in remission took either curcumin or placebo, along with conventional medical treatment, for 6 months. Those who took curcumin had a significantly lower relapse rate than those who took placebo. Osteoarthritis: Because of turmeric's ability to reduce inflammation, researchers have wondered if it may help relieve osteoarthritis pain. One study found that people using an Ayurvedic formula of herbs and minerals with turmeric, winter cherry (Withinia somnifera), boswellia (Boswellia serrata), and zinc had less pain and disability. But it's impossible to know whether turmeric, one of the other supplements, or all of them together, was responsible for the effects. Heart Disease: Early studies suggested that turmeric may help prevent atherosclerosis, the buildup of plaque that can block arteries and lead to heart attack or stroke. In animal studies, an extract of turmeric lowered cholesterol levels and kept LDL (bad) cholesterol from building up in blood vessels. Because it stops platelets from clumping together, turmeric may also prevent blood clots from building up along the walls of arteries. But a double-blind, placebo-controlled study found that taking curcumin, the active ingredient in turmeric, at a dose of up to 4 g per day did not improve cholesterol levels. Cancer: There has been a great deal of research on turmeric's anti-cancer properties, but results are still very preliminary. Evidence from test tube and animal studies suggests that curcumin may help prevent or treat several types of cancers, including prostate, breast, skin, and colon cancer. Tumeric's preventive effects may relate to its antioxidant properties, which protect cells from damage. More research is needed. Cancer should be treated with conventional medications. Don't use alternative therapies alone to treat cancer. If you choose to use complementary therapies along with your cancer treatment, make sure you tell all your doctors. Bacterial and Viral Infections: Test tube and animal studies suggest turmeric may kill bacteria and viruses, but researchers don't know whether it would work in people. Uveitis: A preliminary study suggests curcumin may help treat uveitis, an inflammation of the eye's iris. Preliminary research suggests that curcumin may be as effective as corticosteroids, the type of medication usually prescribed. More research is needed. Neurodegenerative Conditions: Tumeric's powerful antioxidant, anti-inflammatory, and circulatory effects may help prevent and treat neurodegenerative diseases, including Alzheimer disease, Parkinson disease, multiple sclerosis, and other conditions.